eHost as a brand was originally founded in 1994, and they launched their current web hosting site and started to provide regular website hosting service since January of 1999. 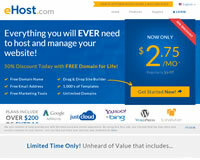 In early 2011 eHost.com claims their hosting services were updated with a new mission to provide simple yet full-featured services offering a single web hosting plan that combined the power cPanel control panel and regular website hosting as well as extremely user friendly drag and drop website builder that enables to build a beautiful website within no time. At the time of writing this review eHost reports that their platform serves over 1 million web sites and they plan to develop further. eHost.com datacenter is based in Provo, Utah, and it resides within the Ace Data Centers facility that claims to provide an extremely efficient 8,500 square feet data center design with an unique feature of energy efficient pod design, boasting a power usage effectiveness (PUE) below 1.2 points. Ace Data Centers states to provide a high quality redundant infrastructure. Power is fed through redundant critical paths, dual segregated transformers, 750kW UPS battery backup units, N+1 diesel generators with thousands of gallons of on-site fuel storage each. Fire protection is provided by laser scanner smoke and heat detection systems, misting fire suppression system, and a nitrogen fire suppression system. eHost consider that they operate a high performance fully redundant network utilizing the latest technologies. They utilize a wide range of network carriers such as Level 3, nLayer, Comcast, Cogent Communications, and Hurricane Electric. According to eHost their system administrators monitor all servers 24 hours a day, 7 days a week, and all possible issues are acted upon before they become serious enough to damage the network or single web server. cPanel Control panel enables to setup sites, email accounts, install blogs, forums, online stores, etc. Marketing Suite that contains $100 Google Adwords and $100 Yahoo/Bing credits, Site Analytics software, SEO tools and tips, etc.